Most of the time, when disaster strikes or severe weather happens, people pull together. Neighbors help neighbors; strangers help strangers. Disaster brings out the best in most people, but not three teenagers in Kansas City, Missouri. The three teens, a 16-year-old, 17-year-old, and 18-year-old Darion O. Page, went out in the snow not to help, but to harm. 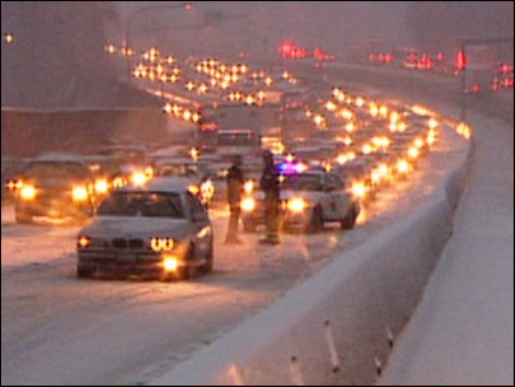 The three teenagers robbed stranded motorists who were stuck in snow drifts. Fortunately, poetic justice is poetic. The three teenagers who were robbing motorists who were stuck in the snow were apprehended by police after… you guessed it, they got stuck in the snow, too. Once apprehended, the Three Musketeers promptly turned on one another. The 17-year-old said he was just driving. Page, the 18-year-old says the 16-year-old was the robber. The 16-year-old said nothing.